A wine distributor told me that a friend of his wanted to sell some old wines going back to the 1960’s. 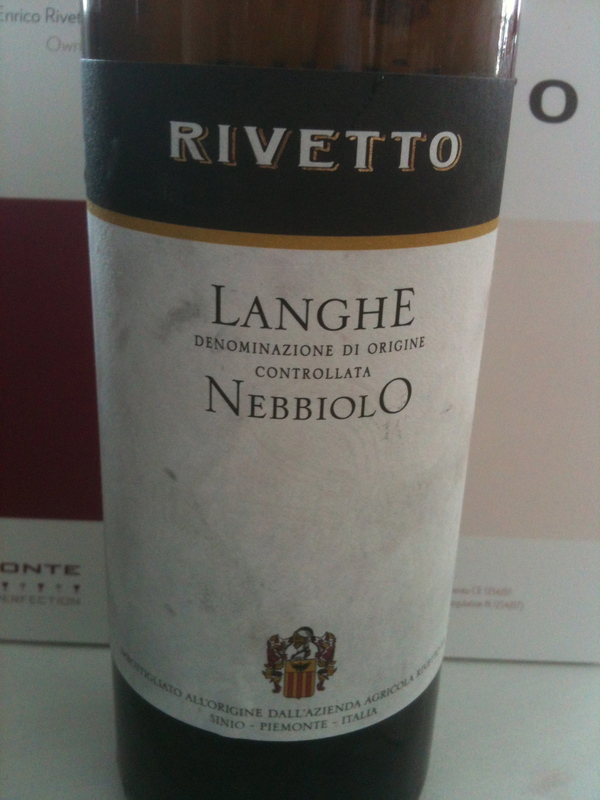 He said that the wines were from Piedmont and included Barolo, Barbaresco and Nebbiolo d’Alba. The price was negotiable and I decided to take a look. What I found was not what I expected. The wines were stored in the basement of the owner’s business. They had been kept unopened in the original cardboard cartons that were so old they were beginning to fall apart. 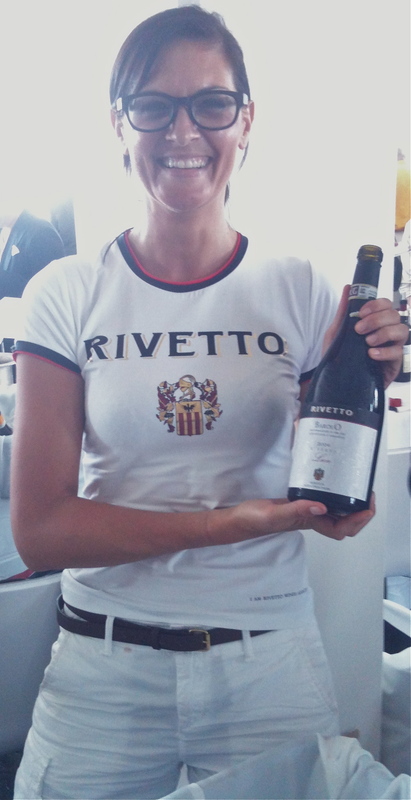 The wines were from Rivetto, a producer that I know and whose wines I have often enjoyed. There was the 1964 and 1967 Barolo, 1985 Barbaresco, 1970 Nebbiolo and 1985 Nebbiolo d’Alba. We agreed upon a price and I bought one of each to see if they were still drinkable. I contacted Enrico Rivetto on Facebook and he said the Nebbiolo should still be good but he had not had the Barolo or Barbaresco from these vintages in a long time so he was not sure about these wines. I opened the wines over a period of one week and found them all to be in good condition with some showing signs of age. I went back with a friend and we bought a number of bottles. Barolo 2008 Commune di Serralunga D’Alba DOCG 100% Nebbiolo. Destemmer crushing and cold fermentation takes place for 2 days. Fermentation in stainless steel tanks and maceration for 20 days. Indigenous yeast is used. Fining with fresh egg whites and filtration with inert material. Aging is in 31HL oak casks for 32 months and 10 months in bottle before release. 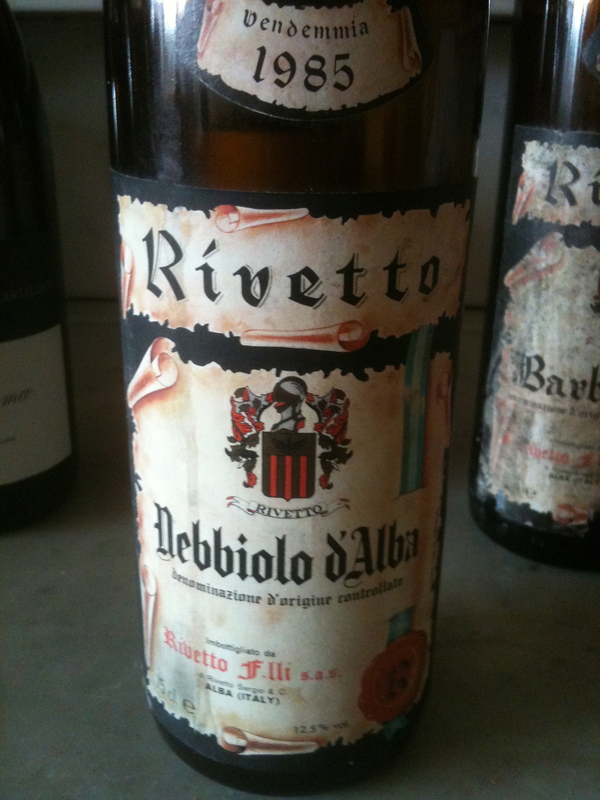 Nebbiolo d’Alba 1985 Rivetto & Figli I opened a few of these and only had one bottle that was too old. Tasted blind I would have guessed these wines as a Barolo or Barbaresco- the Nebbiolo character was all there. 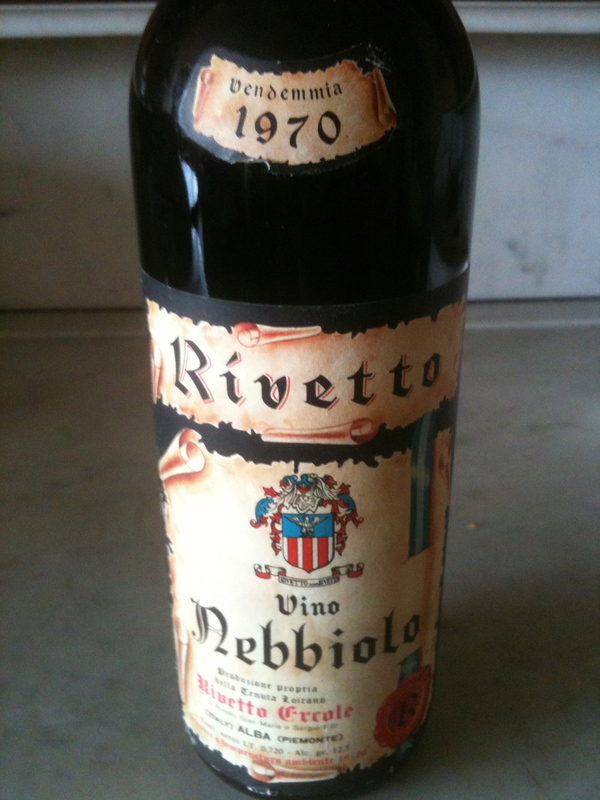 Nebbiolo 1970 Rivetto Tenuta Loirano di Rivetto Gian Maria e Sergio F.lli. It is not in a 750-size bottle but a 720 bottle. I have only opened one bottle of this vintage and it was in better condition than most of the 1985’s. 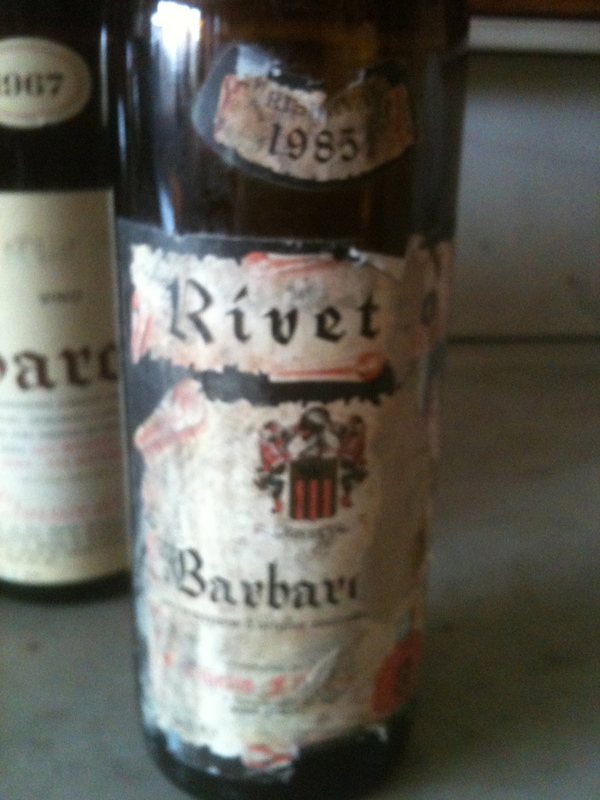 Barbaresco 1985 Rivetto & Figli 750 bottle. I have opened two bottles of this wine and one was in very good condition while the other-which I think must have been in a flood because the condition of the label-was very poor. 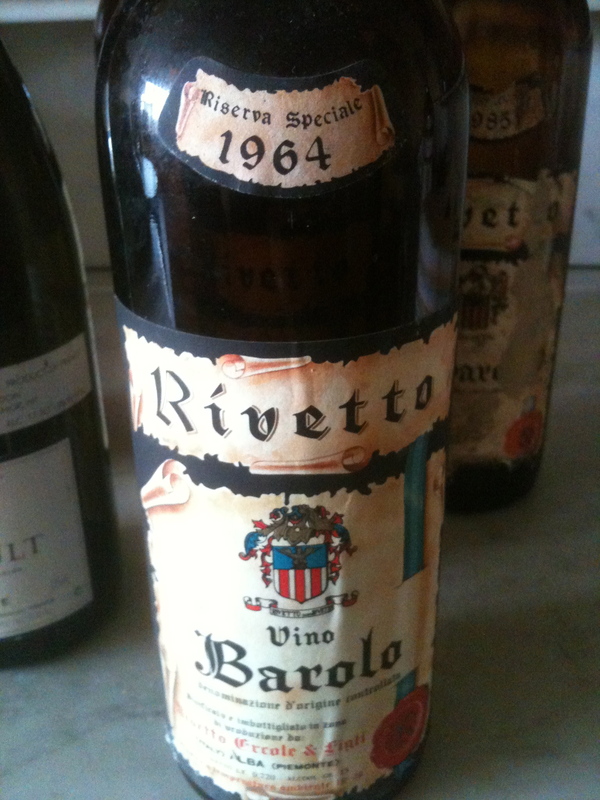 Barolo 1964 DOC Rivetto Ercole& Figli 720 bottle I opened a number of these wines and have had very mixed results, the ones that were good were very, very good but there were a few that were not ready to drink. 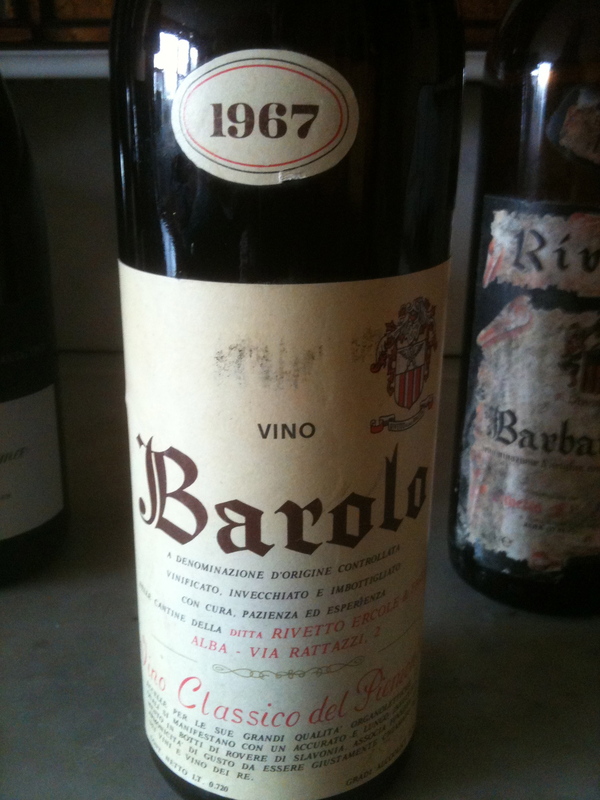 Barolo 1967 DOC Rivetto Ercole & Figli (Vino Classico del Piemonte) 720 ml. All of the wines are in Bordeaux shaped bottles. Some have been very good and others were really showing their age. 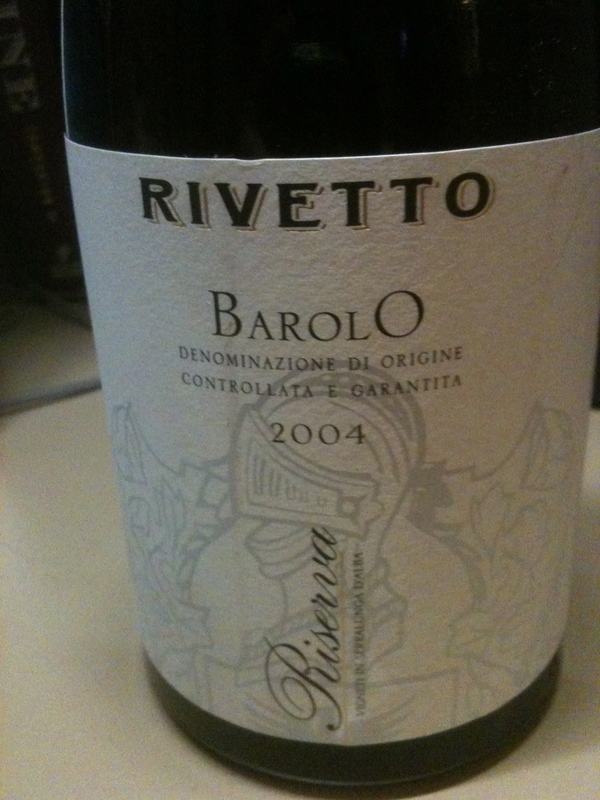 Barolo 2004 Riserva DOCG Rivetto has now gone to the Albeisa bottle for all of his Barolo and some of his other wines. 2004 was a very good vintage and I purchased this bottle of Barolo and am looking forward to opening it in a few years. Remember one does not drink great wine but great bottles of wine.